Hey all! Seems like I was just here sharing a Taco Tuesday post with you all. Oh wait, I was. Well, last time I was here, that is. And of course, now I have another great one to share with you. And it’s one of those slow cooker recipes that you can do after you get home, since it only takes a couple of hours! That’s nice, right? No need for the oven or to remember to get it started before work. Winning!! As I may have mentioned in the Honey Dijon Chicken Skillet post last week, I have a strong love for all things honey and mustard. So naturally I was drawn to these tacos. Naturally. Speaking of natural things. I am 19 weeks as of yesterday and Sunday night I felt our little girl move for the first time. I wasn’t sure at first if that is what I was feeling, but the “popping” that I’ve heard some describe was there. And then I felt it again yesterday at work. It’s an exciting feeling, that’s for sure. And reassuring, at the same time. We have our next ultrasound on the 20th and I can’t wait to see her again. It will be the second, and last time, we see her until she’s here in our arms!! Ack! I’m going to have a baby, you guys!! It’s still surreal at times. Like, I can’t believe this is happening and that we are so blessed. Sigh. Ok, ok. Baby update over, now back to the food! 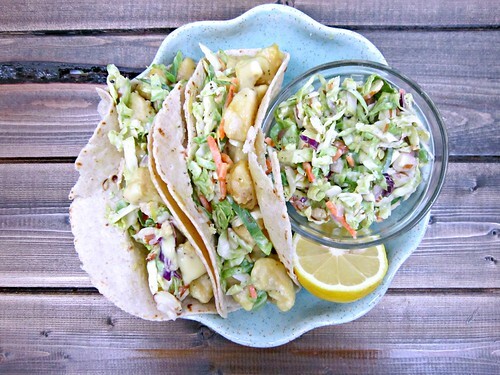 I have also grown very much to love different types of slaw on my tacos. The crunch is nice, and it’s has a little more nutrition than plain ol’ shredded iceberg lettuce. Not that I don’t love that on tacos, too. And of course when you add in lemon zest and juice and a slew of other goodies, it’s that much better!! At first glance I wondered if the slaw was enough “other stuff” on the tacos or if I would feel like I was missing additional toppings, but it was perfect! Packed full of flavor and crunch, the perfect accompaniment to the sweet and tangy chicken pieces, all wrapped up in a tortilla. That’s Taco Tuesday heaven for ya, right there!! 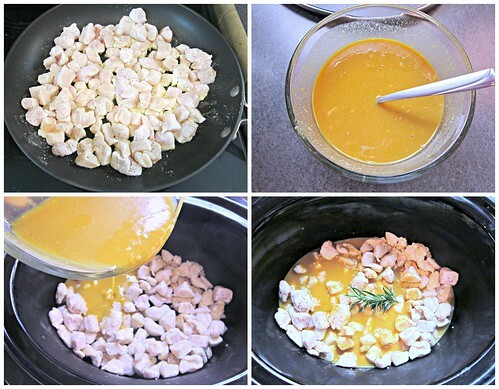 Place the cubed chicken in a large, resealable plastic bag. Add the cornstarch, salt and pepper, seal the bag and shake to coat all the chicken pieces. Heat the olive oil in a large skillet over medium-high heat. Add the chicken pieces and cook until lightly browned, 3-4 minutes per side. Remove to a paper towel lined plate to drain off any oil, then transfer to your crock-pot. In a small bowl, combine the garlic, honey, both mustards and chicken broth. Mix well and then pour over the chicken. Add the sprig of rosemary and cook on high for about 2 hours, until chicken is cooked through. Remove and discard the rosemary sprig. Meanwhile, in a medium bowl, combine the Brussels sprouts slaw (or shredded Brussels and red cabbage if you shredded yourself), sliced almonds, lemon juice and zest, shallot and Parmesan cheese. Season with salt and pepper and stir to combine. 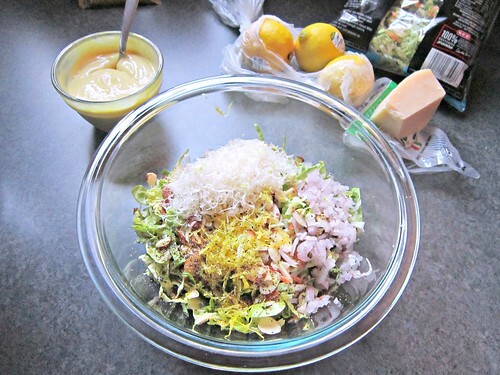 In a separate bowl, combine the remaining ingredients for the dressing. Spoon about a 1/4 cup of dressing into the slaw mixture and stir to combine. Refrigerate until ready to serve. Reserve the remaining dressing to serve with your tacos. 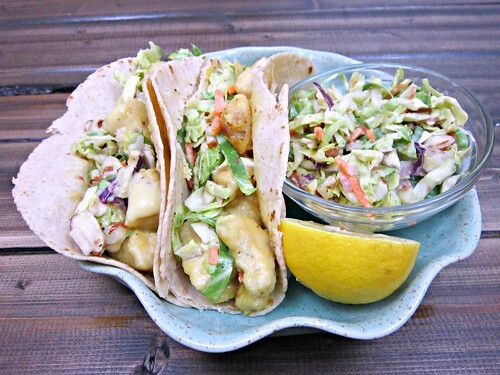 To assemble tacos, warm your tortillas, then top with chicken, slaw, and additional sauce!